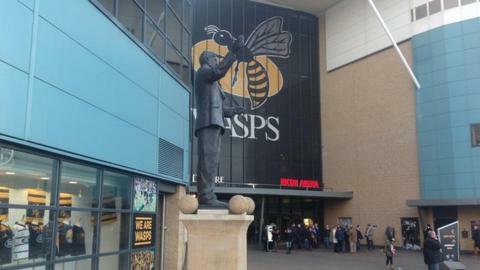 Wasps have taken little over a week to reach the £35m target set for their bond issue, which was oversubscribed. The Premiership club, who moved their matchday base to Coventry's Ricoh Arena in December, launched the new retail bond on the Stock Exchange on 27 April. "We now have a solid foundation for the long term and can look forward to the future with confidence," said Wasps chief executive David Armstrong. Wasps will play Leicester on Saturday in front of a sell-out 32,600 crowd. "The funds raised [from the bond issue] will enable us to restructure our balance sheet and pay down our existing debt, including the loans we acquired with the Ricoh Arena," added Armstrong. Wasps, who are still based during the week at their traditional home in west London, will become one of the world's best-off rugby clubs. The big rise in revenue is a result of the long-standing London club moving from High Wycombe - their matchday home for a decade - to buy the Ricoh Arena, where average gates are in excess of 20,000. Wasps' Football League tenants Coventry City have averaged crowds of less than 10,000 since returning to the Ricoh in September after 14 months in exile at Northampton. On Saturday Wasps, who are still in contention for a top-four Premiership place, will host their first derby at their new home against Leicester Tigers.